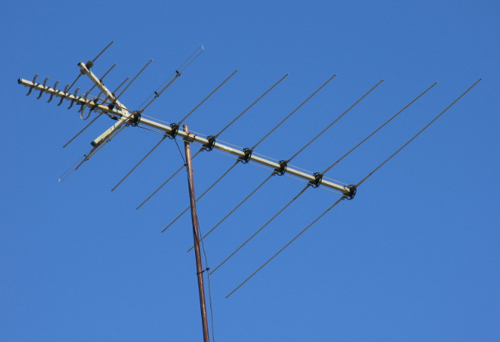 The antenna, that relic of the pre-cable age, gets an afterlife thanks to high-definition TV. Newsweek Feb. 19, 2007 issue – When cable TV arrived in the ’70s, rabbit ears seemed destined to go the way of the polyester pantsuit. So, too, the clunky outdoor antenna, a rooftop fixture that once upon a time signaled the rise of television in American life. But a funny thing happened on the way to the analog dust heap: it turns out that a new generation of rabbit ears and antennas can receive high-definition television broadcasts. And it’s free. The irony is marvelous. Pushed into obsolescence by the technological advances of cable and satellite, antennas are re-emerging thanks to one of the most promising high-tech services of the digital age. High-def channels can be plucked out of thin air by antennas just like regular broadcast signals, no cable, no satellite dish, no monthly bill, no waiting for the cable man. It’s like the old days, except this time antennas (which cost between $18 and $150) may offer the clearest picture. “More than 90 percent of our customers say they want the antennas for high-def,” says Jerry Chapman, owner of online dealer SolidSignal.com, which ships “thousands of antennas.” The downside (and it’s a big one) is that antennas can only pick up the broadcast networks, not cable channels like ESPN or HBO. Still, antenna makers are enjoying a warm reception. Companies like Terrestrial Digital of St. Louis, Winegard of Burlington, Iowa, and Audiovox of Hauppauge, N.Y., are watching sales soar. Terrestrial Digital’s sales have doubled annually since its launch in 2003, to $1.4 million last year, says founder Richard Schneider. The company is “a hobby spiraled out of control,” he says, noting that he got his start essentially selling homemade antennas out of the back of his truck. “People thought I was selling drugs,” Schneider says. “Nerds were showing up in my driveway.” Winegard believes more consumers would embrace antennas if they only knew high-def can be delivered via the anachronism. “Our biggest focus right now is on consumer education,” says Aaron Engberg, manager of “off-air” sales. A corporate clash in televisionland has helped give antenna sales a boost. The dispute involves cable giant Charter Communications and broadcaster Belo Corp., which owns TV stations in several cities. In January, Belo said that unless Charter agreed to pay extra for the high-def signals Belo provides, it would bar the cable operator from redistributing any HD programming that originates from its stations. In cities like St. Louis, where Belo owns the CBS affiliate, that meant viewers wouldn’t get the Super Bowl in high-defas horrifying a prospect to many Bears and Colts fans as running out of beer and chips. Enter Terrestrial Digital’s Schneider, announcing an antenna giveaway in St. Louis. “The best HD for no monthly fee,” Terrestrial Digital declared in local radio ads, touting a free antenna for the first 200 customers. “It was bedlam,” Schneider told NEWSWEEK. “We had lines stretched around the block.” The Super Bowl was (believe it) saved by rabbit ears. In truth, today’s antennas don’t much resemble rabbit ears anymore: they’re smaller, and much more powerful. One model, called the Bowtie, “almost looks like chicken wire,” says Chapman of SolidSignal.com, based in suburban Detroit. Another comes in the shape of a picture frame. But the basic mechanism of the antenna is still the same: it remains “one of the few forms of consumer electronics where there’s been little change since the 1960s designs,” says Schneider. He and apparently growing numbers of consumers are convinced that antennas provide the best of high-def pictures. Because high-def signals are exceedingly more plump than standard TV signals and hog the capacity of their pipelines, cable- and satellite-TV operators “compress,” or squeeze, them (broadcasters don’t have to). There’s a wide belief that the forced dieting degrades picture quality. Naturally, someone must pay. Enter Philip Cohen, a Los Angeles lawyer who filed a class-action lawsuit against DirecTV last September. “Let’s just say the high-definition isn’t what it’s claimed to be,” Cohen says. DirecTV says the suit is without merit. Cohen says he’s aware that high-def can be had with a simple antenna, but because he lives in a hilly area, rabbit ears won’t help. May we suggest a rabbit’s foot?